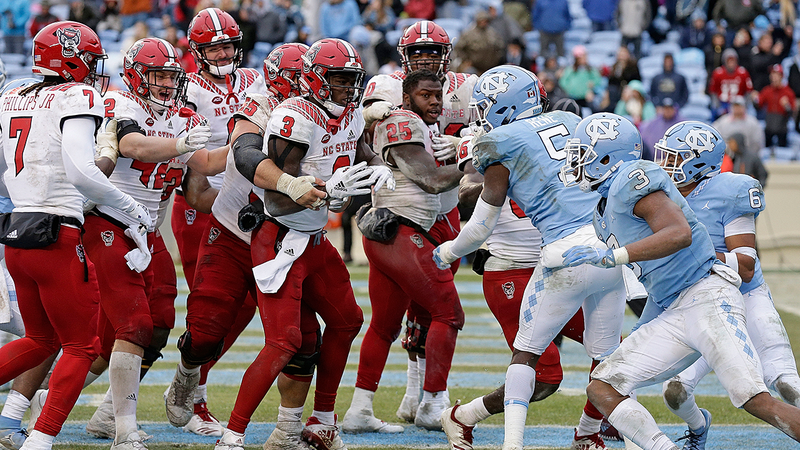 An ugly fight broke out between the University of North Carolina and North Carolina State players after a bitter overtime meeting which ended 34-28 on Saturday. The opponents in the state, turned out as part of the “Rivalry Week”, had been locked in a tight competition, all matches before the NC state drove back Reggie Gallaspy II made the winning touchdown for Wolfpack. Almost just after the seniors made it in the end zone, players from both sides began pushing and shoving. Things then made a trip to the worse when players from both sides loaded their benches against the event. It was when the chaos was developed. Players were seen throwing blows against their opponents and at least one UNC player seemed to hit the ground in the scuffle. In the end, the situation was back under control after the coach came in to separate the two teams. It is unclear who or what started the match. Gallaspy was the star of the day, rushing 129 meters on 27 berries and 5 touchdowns – including the game winner. The NC State drove down the field to win the match after UNC missed a 37-meter field target at the beginning of overtime. The victory took Wolfpack to 8-3 in the season, and they play in East Carolina next week. UNC’s season ended at 2-9 with the loss.